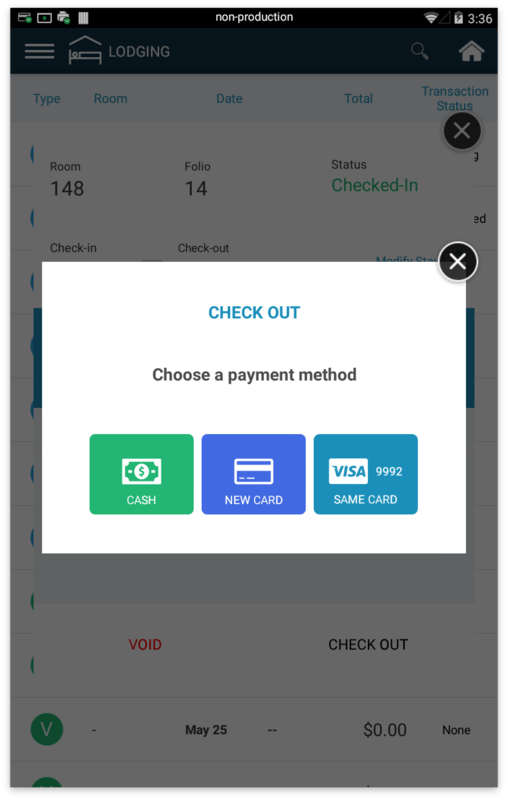 When a guest is ready to Check Out, go to the Check-Out tab to begin the process for capturing the authorized Checked-In and placing that Checked-Out transaction in the current day’s Open Settlement Batch which will be submitted and closed later that day by the lodging clerk/manager. Step 1: Tap on Check-Out Enter the Room Number. Tap Next. Step 2: A pop-up window will appear. Confirm by tapping on the correct record to Check Out. 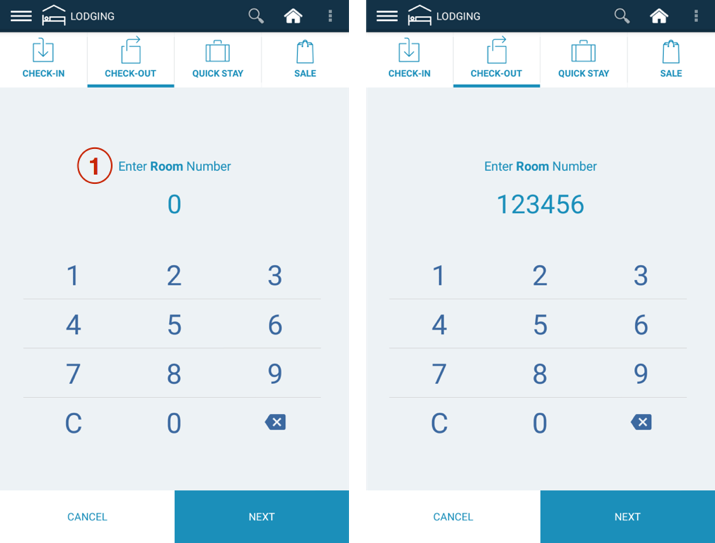 Step 3: Review the details of the Checked-In Stay (eg Room Number, Folio Number, dates of Check-In/Out, amounts, last 4 digits of card, etc). Tap on Check Out to proceed. 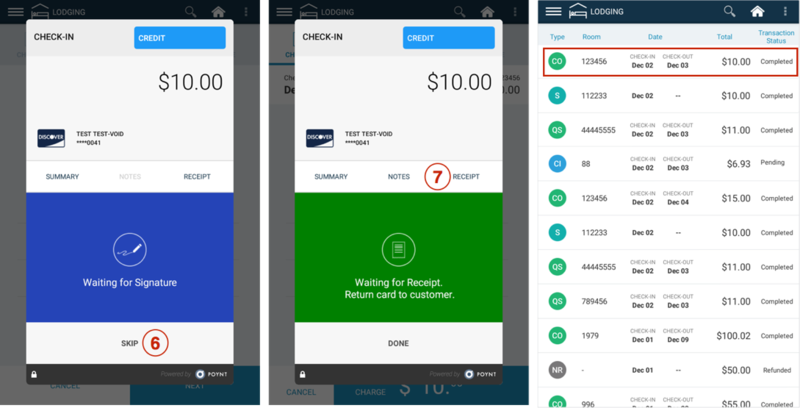 Step 4: Allow guest to select their payment method. 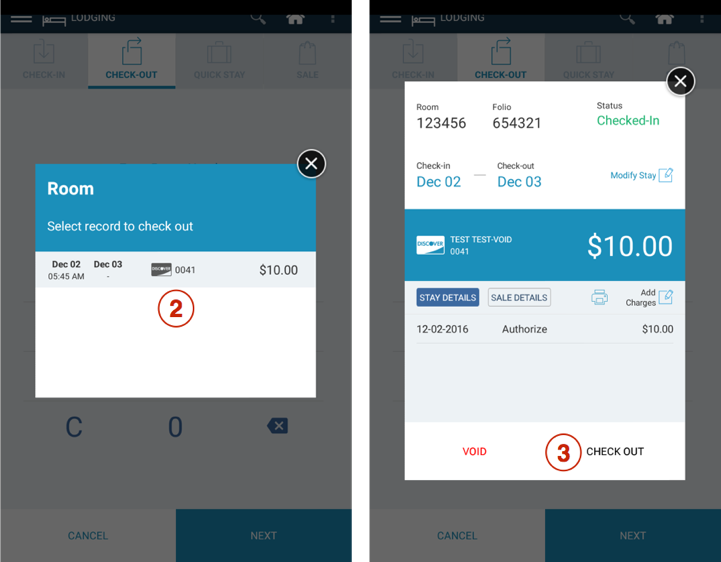 While a credit card is required for all Check Ins, during Check Out the guest may opt to pay with cash, a new card, or the same card they checked in with. 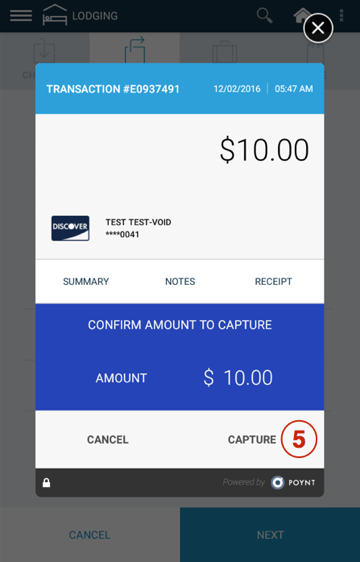 Step 5: If they determine to use the same card, the screen will prompt to review the amount to capture for Check Out. Tap on Capture to proceed. Option: You can also choose to skip this step and obtain signature on the printed receipt. 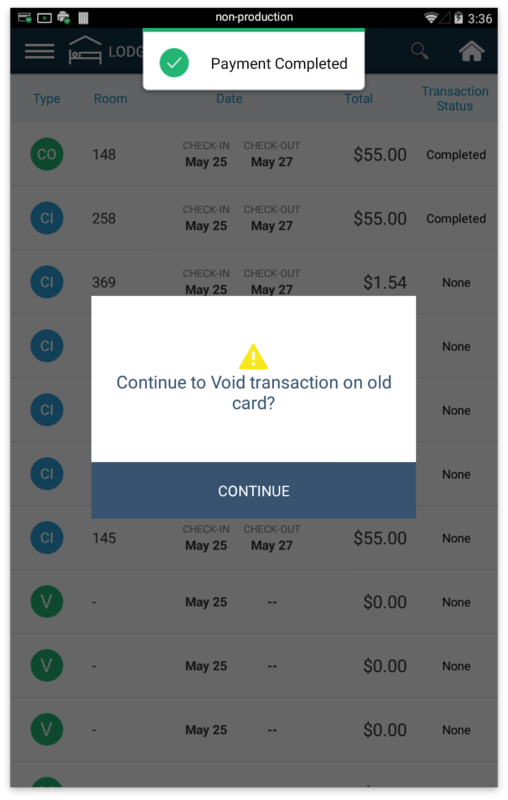 Tap ‘Skip’ to proceed to Receipt screen. Step 7: Wait for customer receipt selection (email, paper, none or text). 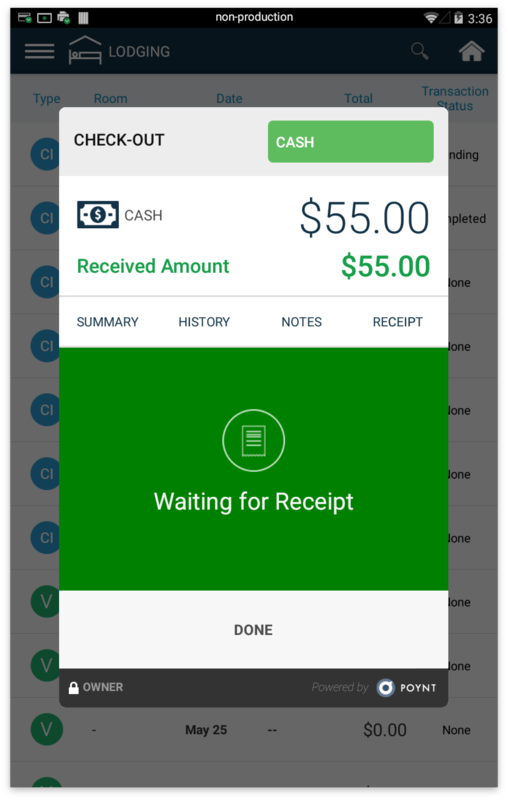 Option: You can also print out a receipt by tapping on the ‘Receipt’ tab.You can see the Check-Out record with the ‘Completed’ Transaction Status in the Details List. If the guest decides to pay with cash for their stay, it will prompt for a normal cash transaction to be completed. 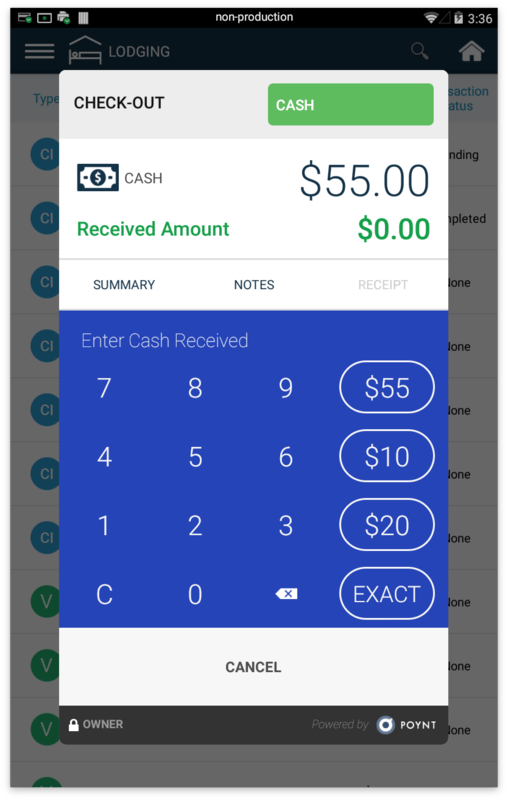 Step 8: Once the cash payment is complete, it will immediately prompt for the authorization during check-in to be voided.